Admit it, at one point or another we've all done it. There's a hard turn ahead or maybe you need to make a U-turn. Then, just as the rear-end starts to come around you touch the gas a smidge harder to snap the rear-end around. If you're lucky you break traction, spin the tires a touch and head on down the road. If you're unlucky, this happens. Photo by Instagram User: yosephnotjoseph. Used with permission. 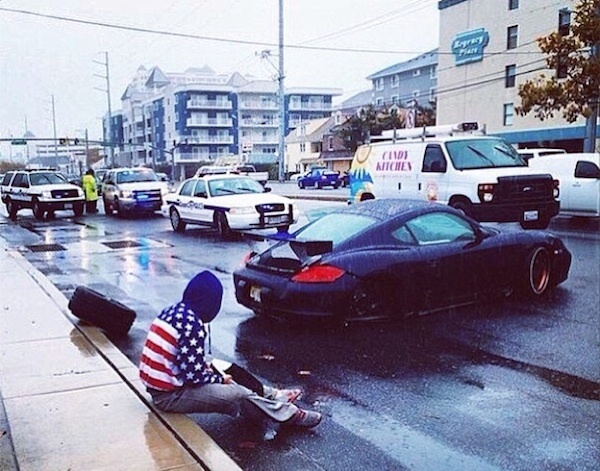 There are conflicting reports on exactly what happened, but one way or another this Cayman lost its entire rear wheel, brake assembly and all, during this weekend's H20 International gathering in Ocean City, Maryland. Photo by Dave Dorsey of Condukt.co. Used with permission. One account of the incident suggests the driver of the Cayman was attempting to do donuts when he lost control of the Cayman and slammed into a curb. However, another witness to the event, who we communicated with, suggests it was more of an aggressive U-turn gone wrong. Either way, the wet conditions, what looks like modified suspension and the biggest wing we've ever seen on a Cayman didn't help the driver any. It may be the car was trying to shed itself of those wheels and wing. In the early 1970s, I was living in Southern California, and liked to hang out at the local exotic car service shop. One Monday morning there was something sitting next to the shop covered with a parachute – I don’t think it was a custom cover – and I took a quick peek. Turned out to be a Miura owned by a local fellow who seems to fit into the “More money than brains” category. Apparently he was running around LA with his girlfriend a day or two previously and slid the Lambo sideways into a tall curb, smashing both right-side wheels and the rocker panel, but even worse, wrecking the right-rear suspension. The nasty part about that was that a Miura’s rear control arms bolt directly to the transaxle/engine casting, and the mounting tabs snapped right off. The Service Manager got on the horn to the dealer, who got on the horn to Sant’ Agata and had two new wheels, a control arm, and lower rocker panel air-freighted to LAX. I recall seeing the freight invoice, and it took my breath away. The transaxle/engine case was repaired by heli-arcing, the new rocker was painted, and everything was screwed back together. The owner sold the car soon afterward. As I recall, this guy also bought a Daytona coupe from someone back east and soon after put it in a ditch, ripping up the starboard sheet metal. It also arrived at this service shop all covered up on a trailer, and the employees were instructed not to let anyone else see it. Today, we’d call the guy a prime candidate for a Darwin award. I moved away soon afterward, so I don’t know if the guy ever figured out why he kept crashing beautiful and very expensive sports cars.